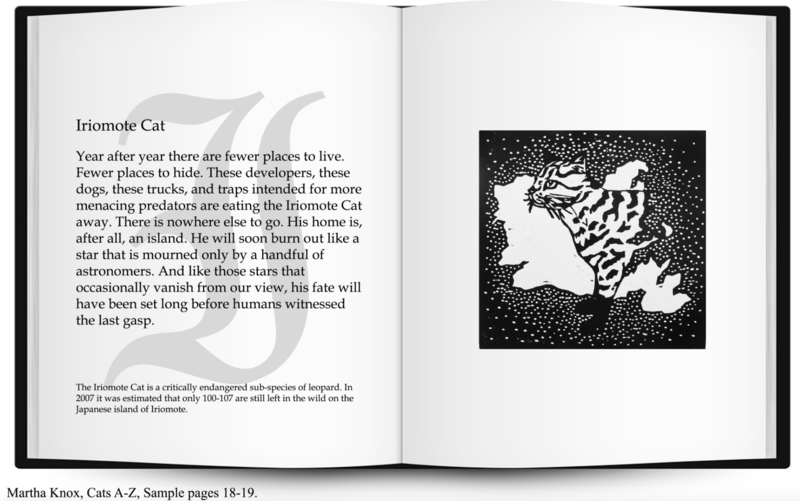 A while back I received an e-mail from artist Martha Knox asking whether I’d like to review her book CATS A – Z. In recent years I’ve become wary of these requests because most of the time the cat books I’m offered are either annoyingly humourous (sorry but I’m not into Lol cats or “I haz” cats) or too mawkish. Of course, I love my cats and think they are cute but they are far more than that. They are interesting, fascinating and complex. Something told me that Martha’s book would be quite different. I was right. The book she sent me is simply amazing. 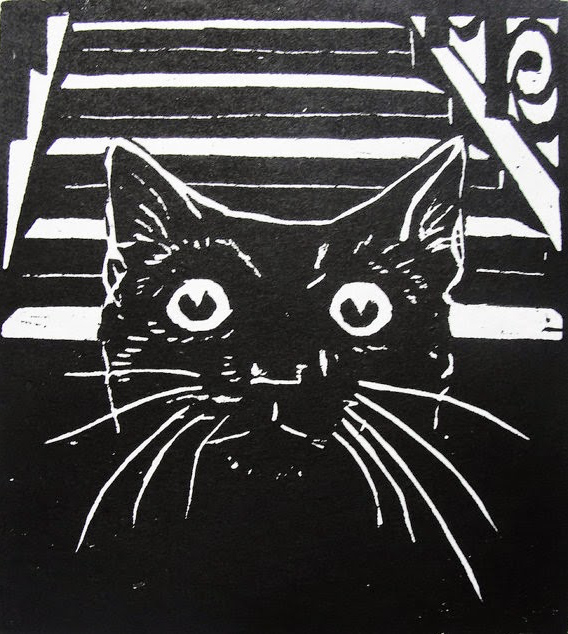 Just look at this woodcut of a sleeping cat. It serves as the end pages of the book. 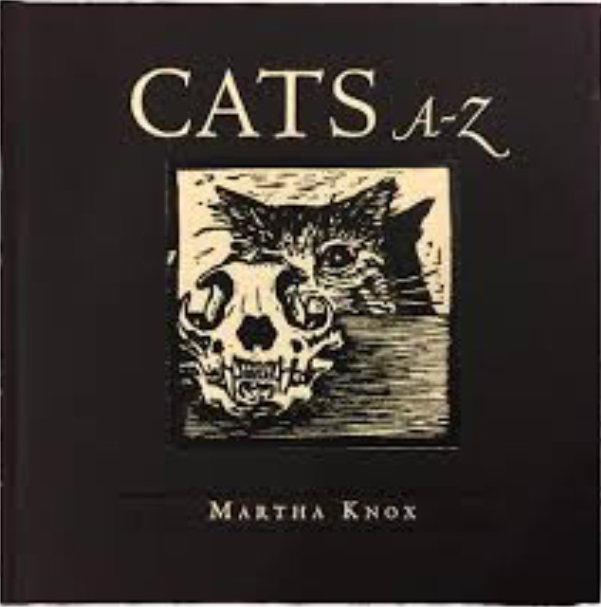 In her book Martha Knox goes through the alphabet sharing true stories and mythology, accompanied by bits of information and illustrated with gorgeous woodcuts. Some of the stories are stunning, some are sad, others are informative. Some stories are about famous cats like All Ball, a kitten adopted by a gorilla in a zoo. Others about unknown cats or literary cats like Raton from Jean de La Fontaine’s fable The Monkey and the Cat. The picture above shows Zombi, the cat of British poet Richard Southey. Southey claimed in a letter that his cat saw the devil. 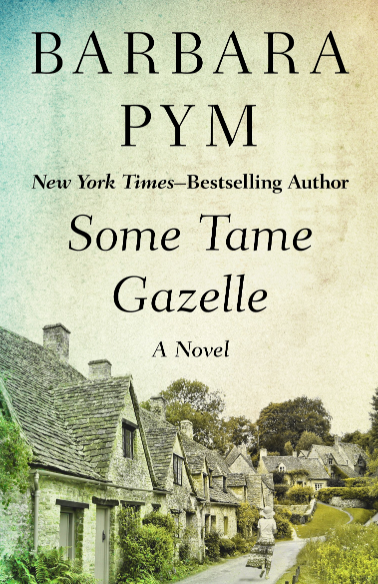 I truly love this book and think that many poeple would enjoy it just as much. It would make a wonderful gift for any cat or art lover. Hi, Caroline! I was so pleased to read your post, and to be able to recommend it to Katia Gregor at scribedoll.wordpress.com , who also is an aficionado of cats. And I wanted as well to recommend a recent post of hers (one back, I think) called “A Little Black Number Called Genie,” about guess what? I think you two are fellow souls in some matters, and as you both write quality websites, I thought this an excellent opportunity to mention you to each other. Cheerio! Thanks so much, Victoria. For the kind words and for introducing Katia’s blog to me. I’ll head over as soon as I get a chance. It sounds like we have some things in common. 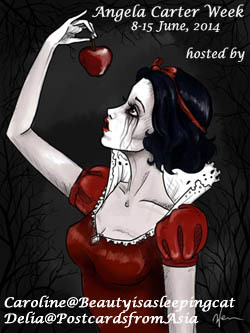 Love the title of that blog post “A Litle Black Number . . .”. Looks like a very, beautiful book, Caroline! That woodcut from the endpages is very beautiful! I think this will make a very beautiful Christmas present. The woodcut illustrations are beautiful! I’m going to add this little book to my Christmas wishlist. I’m glad to hear that. I’m tempted to buy one of her prints. And buy a copy as a gift for someone else. What a gorgeous book. Woodcuts are techinically quite difficult, and these look fabulous. I was so thrilled when I unwrapped it. Not easy at all. I wish I could do that. I share your views on cats. I also agree that this book looks several cuts above many of the silly publications. I will recommend this one to my wife. I’m so glad. She deserves the recognition. It is gorgeous, entertaining and informative. Ah, this seems interesting, Caroline. Thank you for sharing your thoughts. And, I agree with you on the traits of cats. As for the book, I can’t wait to grab my copy. But, I don’t know when it is going to be available in India. Looks like I will have to wait longer. 🙂 Loved the pictures. My pleasure. I’m glad you like it. If you really want a copy, I think you can order it on Etsy or contact Martha via her blog.